Wind causes the W-21 cup assembly to rotate, driving an internal generator that outputs an electronic signal proportional to the wind speed. The W-21 is more compact and lighter than a conventional wind speed sensor. Wind causes the vane of the D24-1 to change direction, activating a potentiometer linked to the vane axis and outputting an electronic signal to indicate the wind direction. 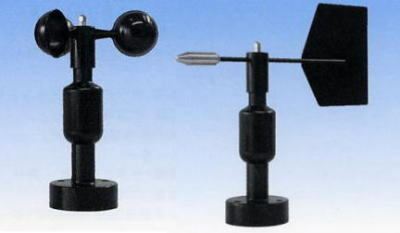 The D24-1 is more compact and lighter than a conventional wind direction sensor.